Empress straddles the Alberta Saskatchewan border not far from the point that the Red Deer River meets the South Saskatchewan. So the first thing you can do when you come for a visit is to walk over to 2nd Street East and take a selfie where the boundary sign shows that you can have one foot in Alberta and the other in Saskatchewan. For summer hours phone 403-565-0009. In 1913 the Canadian Pacific Railway had big plans for Empress. The company intended that the community be a railroad hub between Swift Current and Calgary. To that end they surveyed for miles around and drew up plans for the creation of another 'sandstone city' on the prairies. They sold all the building lots but a few months later the onset of WWI put a damper on that dream. Instead of growing into a city, Empress retained village status providing services to the local farming community. The economy remained healthy until the end of the second World War which had when trucks replaced horse drawn wagons and there was no longer a need for grain elevators every twenty five miles down the tracks. 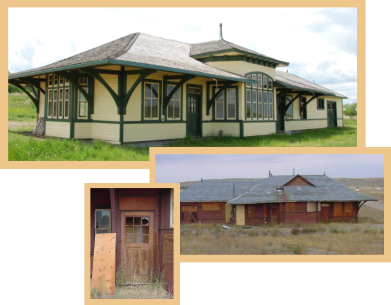 Members of the Empress and District Historical Society worked for more than a decade to restore the decrepit station to it's former glory in time for the Village's Centennial celebrations in 2014. The plan is to re-furnish the interior of the building as it was in those early days...benches along the walls, luggage and lumber piled up in the freight room, a telegraph in the ticket office, a section of tracks running the length of the site. 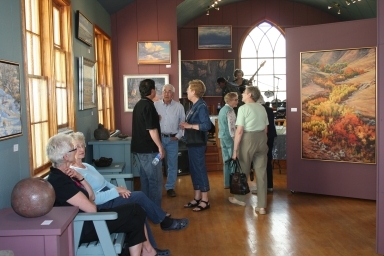 The Historical Society holds various fund raising events throughout the summer and says that the building is available for rent for small gatherings. If you want a tour drop by my store and we'll arrange for someone to show you around. By the way...if you have old trunks, suitcases, milk pails, train tickets, schedules or travel posters from that era, The Society would very much appreciate a donation. Call Pat or Ross at 403-565-0009 for info or a tour. Sagebrush Studios are a destination in themselves. Dean Francis and his wife, Fran, have salvaged three abandoned churches from neighbouring communities, moved them on their property and transformed them into spectacular galleries and studio work spaces. Dean captures on canvas the rolling hills, the steeply cut ravines and the river valleys that define the eastern gateway to the Canadian Badlands. Fran also paints and periodically works in clay. The couple live near the South Saskatchewan River, 12 miles east of Empress (in Saskatchewan) surrounded by the land and wildlife that inspires their art and their lifestyle. Drop into our store to pick up a map and a brochure. The galleries are open from May through September but phone 1-877-565-2039 before your visit just in case they've closed for the day to buy supplies are be proud grandparents. The annual Open House weekend will be held Saturday June 2nd and Sunday June 3rd, 2018. As usual there will be food and entertainment available. Make a day of it and bring your friends. Self Conducted Drive-By Tour of Catalogue Homes stretches from Oyen to Empress. 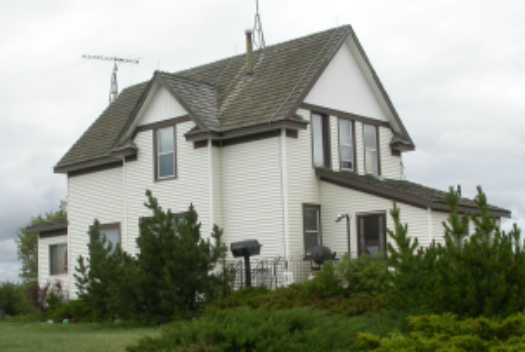 Most of the houses are private residences...the exception being the Pioneer House at the Oyen Museum site and the Tea House associated with the Prairie Elevator Museum in Acadia Valley. Maps and brochures are available at That's Empressive. The Tea House in Acadia Valley, Prairie Bells B & B in Oyen, the Oyen Pioneer Museum and at the Tourist Information Kiosk at the junction of Hwys 9 and 41. Why Buy a House From a Catalogue? Unfortunately good lumber was in short supply on the prairies because the small local lumber yards didn't have the clout to demand top grade product from the British Columbia suppliers. As soon as they established their homesteads and had one or two years of good crops, families were eager to move out of their shacks and sod houses into "real" homes. Recognizing an opportunity, catalogue operations like Eatons in Winnipeg provided the plans, lumber, hardware...even the glazing...in the form of a build-your-own-house kit that was delivered to the nearest railway station. A company like Eatons had the power to be able to demand first class boards, beams and studs. But Eatons wasn't the only catalogue house provider. 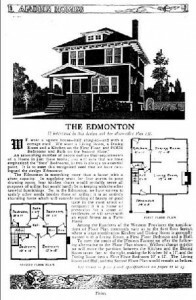 Sears was big in the United States but here in Canada United Grain Growers had a catalogue of plans for houses suitable for large-turn-of-the-century families as did the Alladin company in Vancouver. The latter provided materials for somewhat upscale houses that they promoted as suitable homes for bank managers and the like. Toll free: 1-866-379-2159 Call for availability. 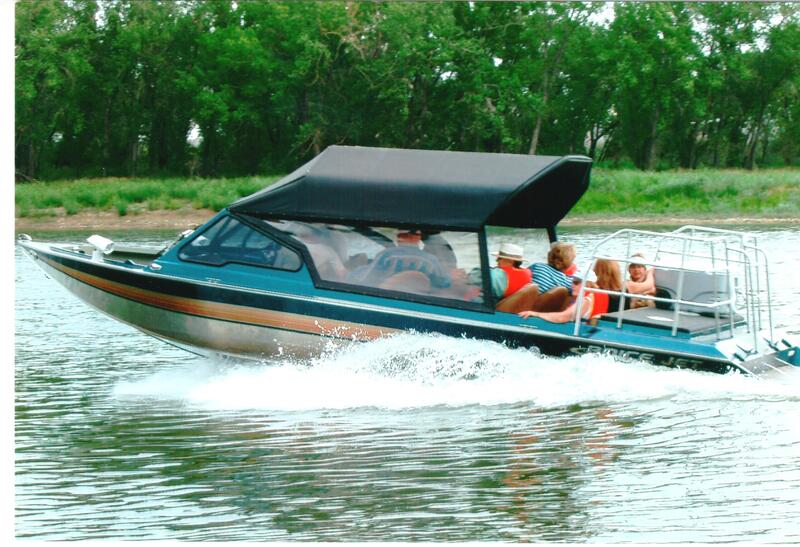 If you want to see the Canadian Badlands from a different perspective see what Riverbend Jet Boat Tours has to offer. The trips usually begin in Medicine Hat and the boat travels north along the South Saskatchewan River to the point where it meets with Highway 41 at the Sandy Point Bridge and campground. The banks of the river are lined with hoodoos, undiscovered dinosaur bones, and lots of wildlife. For a dude ranch experience book yourself into the 100 year old homesteader's log cabin on the Western Uplands Ranch which stretches across 34,000 acres or prairie, ravine and river valley. Some folks bring their own horses!! In season this family offers guided hunting packages specializing in upland birds. 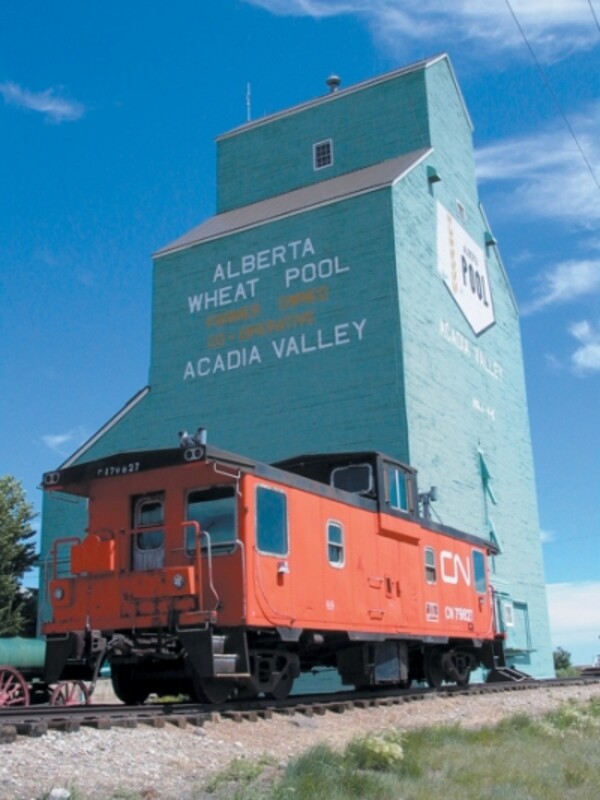 The old Alberta Wheat Pool Elevator has been open since 1991 as an interactive museum. The equipment is still operable and visitors are able to go inside the prairie icon and take a peek at history. The Tea Room next door is housed in an old Eatons catalogue house. For summer hours and what's available for picking call 403-565-2191 or cell 306-628-7125. You can't beat the taste of farm fresh fruits and berries...especially when you pick them yourself! Located on the banks of the meandering Red Deer River, the orchard offers U-Pick raspberries, saskatoons and apples in season which runs from late July to late September weather permitting. Bring a picnic basket so that you can relax and enjoy the multitude of songbirds, game birds and woodpeckers that make the orchard their home.